The 1980 LSU Tigers football team represented Louisiana State University (LSU) during the 1980 NCAA Division I-A football season. Bo Rein was hired November 30, 1979 after four seasons at North Carolina State as the successor to Charles McClendon, who compiled a 137–59–7 record in 18 seasons. Rein's tenure was cut short after only 42 days when he died in a plane crash January 10, 1980. Jerry Stovall, a former LSU All-American and nine-year National Football League veteran with the St. Louis Cardinals, was approved as Rein's successor approximately 36 hours after the plane crash. *Non-conference game. Homecoming. #Rankings from Coaches' Poll released prior to game. Jerry Lane Stovall is a former American football player and college athletics administrator. He played college football at Louisiana State University, where he was a selection to the 1962 College Football All-America Team as a halfback. Stovall played professionally as a back and punter in the National Football League with the St. Louis Cardinals from 1963 to 1971. Stovall served as the football coach at his alma mater, LSU, from 1980 to 1983, compiling a record of 22–21–2 in four seasons. He was the director at Louisiana Tech University from 1990 to 1993. Born and raised in West Monroe, Stovall graduated from West Monroe High School in 1959 and he played college football at Louisiana State University in Baton Rouge, succeeding Heisman Trophy winner Billy Cannon as the Tigers halfback. Stovall served a multitude of roles for the Tigers, including running back, defensive back, return specialist and his primary position was left halfback, which in the days of one-platoon football was both a running back and defensive back. His 57-yard run in 1961 helped LSU defeat arch-rival Ole Miss by a score of 10–7 in a major upset, Stovall was a unanimous choice for the All-America team of 1962 at halfback. He won the Walter Camp Memorial Trophy as the nations best back, was named SEC Player of the Year and he finished 89 votes behind Oregon States Terry Baker. Stovall was the second pick in the 1963 NFL draft. 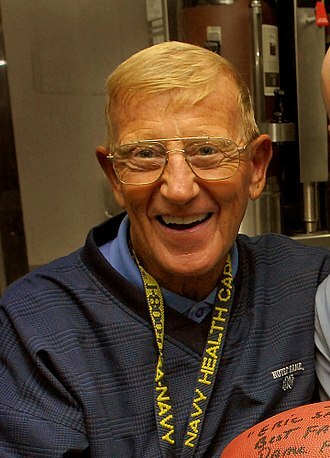 He was the third pick of the 1963 American Football League draft. The Cardinals converted him to defensive back. He was regarded as one of the top rookies in the league in 1963, during his nine seasons with St. Louis, Stovall had 18 interceptions in 97 games, and was selected to the Pro Bowl after the 1966,1967, and 1969 seasons. After his NFL career, Stovall became a football assistant coach. He eventually returned to LSU, as an assistant for head coach Charlie McClendon, Stovall became LSUs head coach as an emergency hire after new head coach Bo Rein died when his plane depressurized and disappeared over the Atlantic Ocean. The Rice Owls football team represents Rice University in NCAA Division I college football. 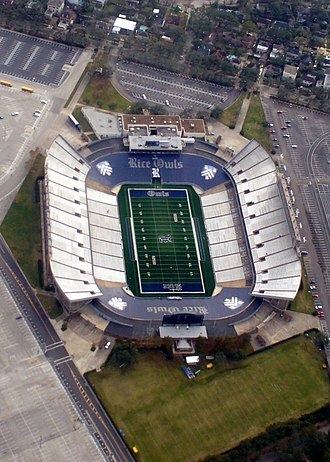 The Owls have competed in Conference USAs Western Division since 2005, Rice Stadium, built in 1950, hosts the Owls home football games. Rice Stadium was built in 1950, and has been the home of Owls football ever since and it hosted the NFL Super Bowl on January 1974. It replaced the old Rice Field to increase seating, total seating capacity in the current stadium was reduced from 70,000 to 47,000 before the 2006 season. The endzone seating benches were removed and covered with tarps, and all of the bleachers were replaced with new, metal seating benches in 2006. The stadium is currently undergoing further renovations. The Owls played in the eighteenth Cotton Bowl Classic against the Crimson Tide of Alabama, referee Cliff Shaw saw Lewis come off the bench and gave the Owls the 95 yard touchdown. Rice would win the game 28-6, with the only Crimson Tide score coming from Lewis, the yardage added to Moegles 265 yards rushing, a Cotton Bowl Classic record that would stand until Tony Temples effort in 2008. This would be the Owls last bowl win until the 2008 Texas Bowl, Rice Stadium hosted a speech by John F. Kennedy on September 12,1962. In it, he used the Rice football team to challenge America to send a man to the moon, but why, some say, the moon. Why choose this as our goal, and they may well ask why climb the highest mountain. Why,35 years ago, fly the Atlantic and we choose to go to the moon. The rivalry is because Rice and SMU were two of four schools in the old Southwest Conference. 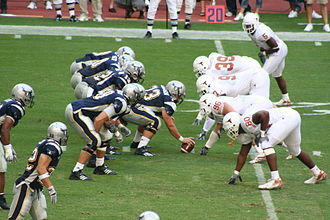 Rice participates in a rivalry with Houston. UH and Rice play annually for the Bayou Bucket, a weathered bucket found by former Rice guard Fred Curry at an antique shop, Curry had it designed into a trophy for $310. 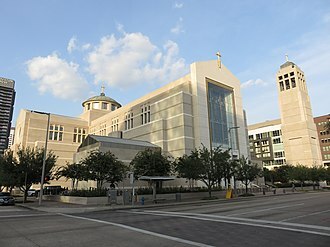 The two universities are separated by five miles in Houston, the Cougars lead the series 29-11. The Cougars 2013 move from Conference USA to the American Athletic Conference has jeopardized the status of the series though, it is scheduled to resume in 2017. Rice and Texas have maintained a largely one-sided rivalry beginning in the days of the Southwest Conference. Tuscaloosa is a city in and the seat of Tuscaloosa County in west central Alabama. Located on the Black Warrior River, it is the fifth-largest city in Alabama, Tuscaloosa is the regional center of industry, commerce and education for the area of west-central Alabama known as West Alabama. It is the city of the Tuscaloosa Metropolitan Statistical Area. Tuscaloosa is the home of The University of Alabama, Stillman College, Tuscaloosa has been traditionally known as the Druid City because of the numerous water oaks planted in its downtown streets since the 1840s. 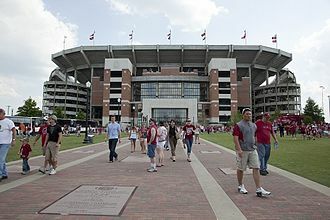 The city has become well known nationally for the University of Alabamas success in sports. 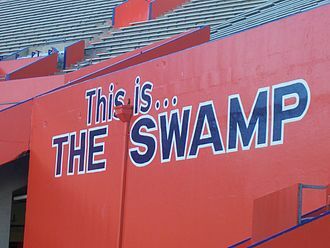 City leaders adopted the moniker The City of Champions after the Alabama Crimson Tide football team won the BCS National Championship in their 2009,2011, the Tide went on to win the College Football Playoff in the 2015 season. In 2008, the City of Tuscaloosa hosted the USA Olympic Triathlon trials for the Beijing Games, nearly 12,000 years ago, Native Americans or Paleo-Indians arrived in what today is referred to as the Deep South. Paleo-Indians in the South were hunter-gatherers who pursued the megafauna that became extinct following the end of the Pleistocene age, after thousands of years, the Paleo-Indians developed a rich and complex agricultural society. 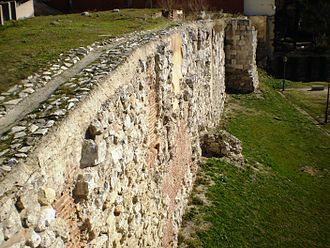 Archaeologists called these people the Mississippians of the Mississippian culture, they were Mound Builders, descendant Native American tribes include the Creek. In 1828, Andrew Jackson was elected president of the United States and he had gained popularity when he defeated the Creek at the Battle of Horseshoe Bend in 1814, following victories in the War of 1812. 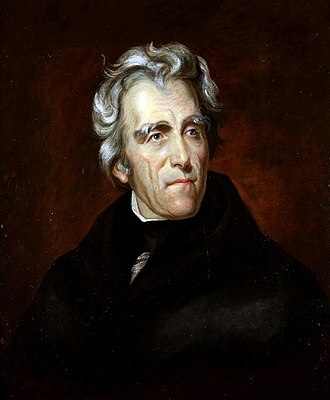 He long proposed Indian removal to the Indian Territory west of the Mississippi, Jackson abandoned the policy of his predecessors of treating different Indian groups as separate nations. 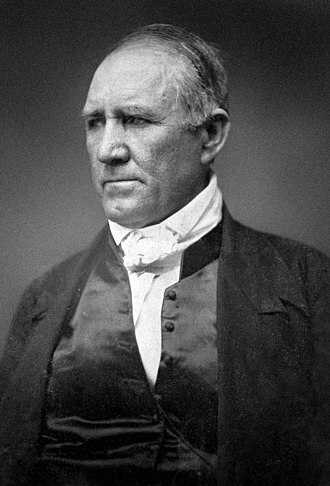 Instead, he pursued plans to move all Indian tribes living east of the Mississippi River. Most Muscogee-speaking peoples were removed to Indian Territory during the Trail of Tears in 1834, some Muscogee in Alabama live near Poarch Creek Reservation in Atmore. 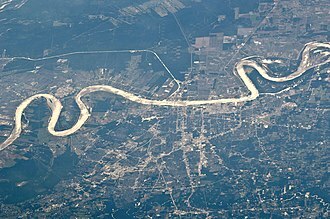 Jackson, officially the City of Jackson, is the capital city and largest urban center of the U. S. state of Mississippi. It is the seat of Hinds County, equally sharing its county power with the Town of Raymond. The City of Jackson owns more than 3,000 acres, Jackson is on the Pearl River, which drains into the Gulf of Mexico, and it is part of the Jackson Prairie region of the state. The city is named after General Andrew Jackson, who was honored for his role in the Battle of New Orleans during the War of 1812, the current slogan for the city is The City with Soul. It has had numerous musicians prominent in blues, gospel and jazz, the city is the anchor for the metropolitan statistical area. While its population declined from 184,256 at the 2000 census to 173,514 at the 2010 census, the 2010 census ascribed a population of 539,057 to the five-county Jackson metropolitan area. The Choctaw name for the locale was Chisha Foka, the area now called Jackson was obtained by the United States under the terms of the Treaty of Doaks Stand in 1820, by which the Choctaw ceded some of their land. After the treaty was ratified, European-American settlers began to move into the area, under pressure from the U. S. government, the Choctaw Native Americans agreed to removal after 1830 from all their lands east of the Mississippi River under the terms of several treaties. They gave up their membership and became state and United States citizens at the time. Today, most Choctaw in Mississippi have reorganized and are part of the federally recognized Mississippi Band of Choctaw Indians and they live in several majority-Indian communities located throughout the state. The largest community is located in Choctaw 100 mi northeast of Jackson, the village became known as LeFleurs Bluff. During the late 18th century and early 19th century, this site had a trading post and it was connected to markets in Tennessee. Tennessee soldiers returning from the military campaigns near New Orleans in 1815 built a road that connected Lake Pontchartrain in Louisiana to this district. 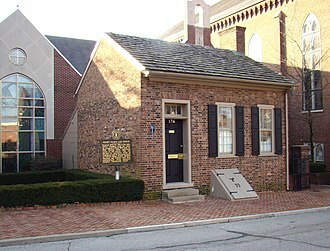 A United States treaty with the Choctaw, the Treaty of Doaks Stand in 1820, LeFleurs Bluff was developed when it was chosen as the site for the new states capital city. Mississippi Veterans Memorial Stadium is an outdoor football stadium in Jackson, United States. Veterans Memorial Stadium is the field of the Jackson State Tigers football team. The stadium was known as War Veterans Memorial Stadium later as Hinds County War Memorial Stadium before finally being christened with its current moniker. In the past it has served as a home stadium for The University of Mississippi, Mississippi State University. From 1973 to 1990 the Egg Bowl was played there and from 1992 to 2013 it hosted the Mississippi High School Activities Association state championship football games, in addition to college and high school games it has hosted several National Football League preseason games. Construction on the facility began in early 1949 and it opened in 1950 with a capacity of 21,000. By 1953 temporary seating had brought the capacity up to 25,000, in 1981 it underwent an expansion that brought total capacity to 62,512, although subsequent renovations dropped the current seating to the official 60,492 seats. The stadium hosted its first football game on December 9,1950, a crowd of 18,000 saw Holmes fall to the visiting Rangers 32-12. The first Division I-A game took place on November 11,1952, current tenant Jackson States first game at the stadium was an October 1967 contest versus Grambling State. Notably, the annual Egg Bowl contests between Ole Miss and Mississippi State were held there from 1973 through the 1990 contest, after which the returned to the two schools respective campuses. The last game played there by an SEC school was a win by Ole Miss over Division I-AA VMI in 1996. From 2000 to 2004 Veterans Memorial was home of the renewed Backyard Brawl between Millsaps College and Mississippi College. On September 2,2000, after a 40-year hiatus, the two resumed their football series and in front of a reported crowd of 10,200 spectators Millsaps defeated Mississippi College 20-19. The stadium was host to the annual Capital City Classic between Jackson State and Alcorn State University, both of the Southwestern Athletic Conference, from 1993 to 2010. Taggart is the first full-time African American head football coach in school history. The Brian Patterson Sports Performance Center under construction on Oct. 23, 2015, as seen from the press box. University Corners, viewed from the main entrance to the University of Florida, February 2012. This is now the site of the apartment complex "The Standard", which opened in 2017. 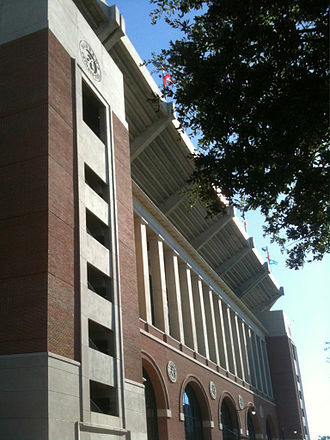 The north end zone entrance in 2007, with commemorative Alabama players statuary group on the left. Exterior of the new south end zone in 2010. 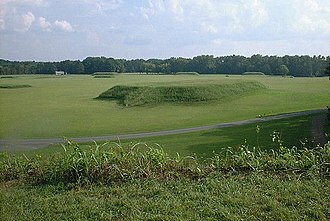 The Moundville site, located a few miles south of Tuscaloosa, was one of the centers of the Mississippian culture. 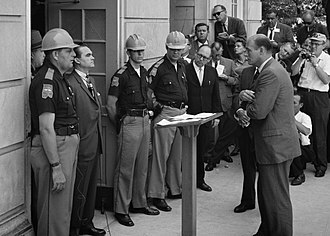 Wallace standing against desegregation while being confronted by Deputy U.S. Attorney General Nicholas Katzenbach at the University of Alabama in 1963.